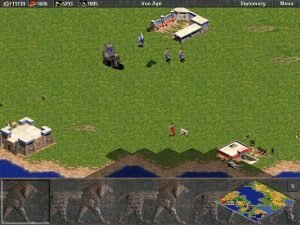 Make no mistake, the best way to get better at Age of Empires is through sheer practice. But even as a beginner, one should find these notes helpful, especially if you are trying to play the solo campaign (online games are played against pros, and is no place for newcommers). Be that as it may, finding some of the best units and civilizations to play with is key, and here is a quick guide on this subject. Minoan strengths include Composite Bowmen with +2 range, +25 farm production, and -30 ship costs. They can build the Juggernaut, Centurion and heavy siege weapons. Disadvantages include weak Priests, Cavalry, later archers, and infantry. 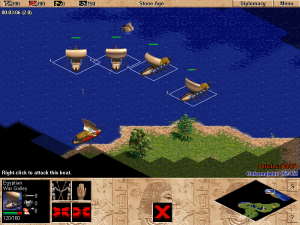 The Minoans are a great choice where naval action is expected and when you go for the early kill. If you are playing on a map with islands, they will perform admirably. Expand early with docks and get the bulk of your food and resources with fishing and ferrying villagers to other parts of the map where they can steal enemy resources. They have some fearsome catapults. If you can protect them, the catapult is the offensive weapon of choice, and can hence destroy towns more effectively than others. Sumerians are also efficient farmers. Sumerian farms allow you to save the cost of farm reconstruction, they free you from being tied to specific locations of naturally occurring sources of food, and they can significantly reduce the idle time of farmers who’s land has been exhausted while your attention is focused elsewhere. Most importantly, the emphasis on food gives you a dependable means by which you will be able to research super units, such as the Heavy Catapult, upon which your Civilization may depend. Lastly, the Sumerians have the Hoplite. The Hoplite is arguably the most powerful unit in the game. Primarily due to its lack of speed, the Hoplite is often under utilized. But for the Sumerians, the Hoplite is essential for the protection of its catapults and can readily be upgraded to Centurion if the Sumerian farms are maintained properly. Hoplites have one weakness, and those are arrows, but in large numbers they will constitute a major threat as a raiding party. Combine them with catapults and you can bulldoze towns quite quickly. Yamato strengths are ships that take +30more hits, mounted units that cost 25% less than usual, and Villagers that are 30% faster. Disadvantages include weak Priests, no heavy land siege weapons, medium quality fortifications, no elephants, and no advanced swordsmen. The Yamato are a good choice where the map contains significant water. Yamato are probably the best to play because they can build cheap Cavalry and Horse Archers, plus they have advantages in ship building. They have access to the best ship upgrades and their ships take extra damage. They also have fast villagers. This, combined with superior horse units, make them fast island jumpers. Expand with them and do your best to hold enemy territory, slowly bleeding them dry. They might not have great fortifications, but do have excellent archers, so place them behind walls and out-range the enemy. Egyptian advantages include +20 0old mining and +330 and Chariot Archer hit points, and +3 Priest range. Priests are the core of the Egyptian attack. In addition, the Egyptians get both types of elephants, all ship types, and all fortifications. The disadvantages to being Egyptian are no Cavalry or quality infantry. They also lack Shields. Strong Chariots make up some for not having Cavalry. Masses of 10 or more Priests are an awesome military force. They can quickly convert front line troops into a new army. They can convert Villagers thought safe behind walls. Egyptian Priests can have the longest range of anyone on the board. Sixteen tiles are a long distance. Four or five of these, fully researched, can decimate an enemy. For a kick, station them on the other side of someone’s walls, just outside of Catapult range, and pick off their civilians or troops. The Assyrians of history were noted for their aggressiveness as warriors. The Assyrians in Age of Empires have similar qualities. These are +40 rate of fire for any units built at the Archery Range and 30% faster Villagers. If you can find an enemy early, the archery bonus may allow you to attack quickly with a force of Bowmen or Chariot Archers and still succeed. If anything, you can cripple their early economy and set them back. Assyrian archers get off three shots for every two of the enemy. Assyrians get all the siege weapon upgrades; disadvantages include weak Iron Age ships, limited Iron Age missile technology, no shields, no Iron Age Hoplite upgrades, no Bowmen upgrades, and no elephants. The Horse Arches has a good range and line of sight, thus requiring less micro-management than close combat units. Its greatest weakness are its low hit points. Horse Archers should attack in numbers, at speed, targeting individual enemy units for quick kills. Shoot from an elevation to increase damage. They are great at destroying enemy combat units or Villagers quickly, and can retreat faster than foot soldiers can catch them. When they attract a heavy enemy response, use their speed to withdraw. Use Priests to heal those units that take damage. The Assyrians and Yamato get advantages when using Horse Archers. The biggest mistake a new player can make with Horse Archers is going on the offensive before amassing enough of them. Since the Horse Archer’s hit points are the lowest of all other Iron Age units, except that of the Ballista, it can be defeated by equal numbers of opposing units. By being patient and waiting until sufficient numbers have been trained, the veteran player can overcome these disadvantages. Use its superior speed to retreat to a safe haven to heal and regroup. The Priest is a unique unit that is often difficult for beginners to use effectively. However, some still consider it their favorite unit. The ability to convert enemy units to your side is a powerful tool on both offense and defense. For almost no cost, a valuable unit can be added to your army and subtracted from the enemy (especially useful for targeting expensive units). Priests with long range can be devastating when grouped against targets that cannot reach them due to intervening Walls or terrain. The ability of Priests to heal damaged units is under-appreciated by new players. Restoring several partially damaged units to full strength is an essentially cost-free way to build units. Priests can also be used to convert enemy ships and buildings. Take a military building in an enemy town and begin pumping out new units right there. The risk in using Priests is that they are very weak and slow and can be killed easily. They must be guarded and supported as siege weapons are. Even though Priests are tough to manage, when they convert a unit it’s like a +3 gain. You reduce your enemy’s units by one, you add one to your own army, and that new unit can immediately kill others. Even if you don’t use them as an attack force, it’s still very useful to have a group of a few priests behind your lines or at your town to treat surviving troops from your early to mid raids. Healing them is always cheaper than building new ones. By the late stages of the game, you should have your economy running at full speed so as to make priests obsolete. The favorite of many, the War Elephant is an awesome unit in hand-to-hand combat. For starters it takes 600 hits, matched only by the Elephant Archer. It can also do damage to several adjacent units at the same time as it tramples them. On the negative side, it is slow, its attack cannot be upgraded by technology, and it is expensive. When using War Elephants, bring them out of the line if possible to heal up the hits which they will be accumulating. Provide fast units and missile units that can fight off enemy archers or Priests targeting your War Elephants. They are just a huge lumbering mass of muscle that can sashay into a fire fight and will always take down more then their weight. They can also make pretty good kindling out of most well-defended civilizations’ structures. Plus, when they fall down and die, they make a really cool sound. 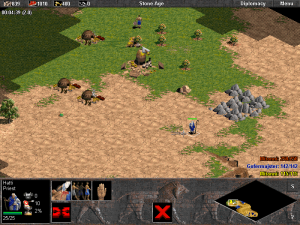 Resource gathering, in particular food, is the most commonly favored tactic to winning Age of Empires. Food is used to build Villagers, advance in Ages, research technology, and build military units. The key is to gather the food that is necessary in the beginning to build a large force of Villagers who in turn keep more food and other resources coming in. Plentiful food production makes it possible to move through the Ages and to research critical technologies. Train those villagers out like they’re on a Ford production line. 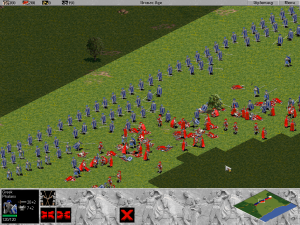 It’s risky not investing in military units early in the game, but if have a large network of villagers gathering resources, then you can eventually win at the production game in the mid portions when armies start attacking. Exploring the map is just as important. Early in the game, send a unit or two at various parts of the map. This accomplishes several things. You locate enemies at an early point and can judge how to get to them and how they will come after you. If you choose the early attack strategy, early exploration is critical. You can identify choke points between your two empires where a defense can be set up to your advantage, rather than defending at your town edge. An early search locates important resources, especially gold and stone, that can be defended. This helps deprive the enemy of these resources while holding them for your own use later. Attack with as large an army as you can, with the highest quality units that you can afford. A couple of Swordsmen have no chance against a Tower, but 10 can take it down fairly quickly with minimal loss. When you can’t put quality units in the field, a mass of inferior units still has a chance. Every type of unit works better in groups. If you have one archer, that isn’t so great, but if you have five or six archers you are going to do some real damage. In an ideal attack, you have a handful of archers, a handful of cavalry, and a handful of some other unit type. Mix and match to achieve the desired effect. I would add that Priests are awsome for map editing too! When I was putting together my scenarios and campaigns in the past I used them and other special units to add tricks and a little bit of role playing to the maps. Are there other knows multiplayer maps that tries to follow this kind of cinematic approach of the original campaigns btw? I would love to play them!